I cannot believe it has taken me this long to make ‘energy bites’, I honestly think they are the best thing in the entire ‘healthy food’ world right now. Okay that may be a little over the top but seriously you need to try these! 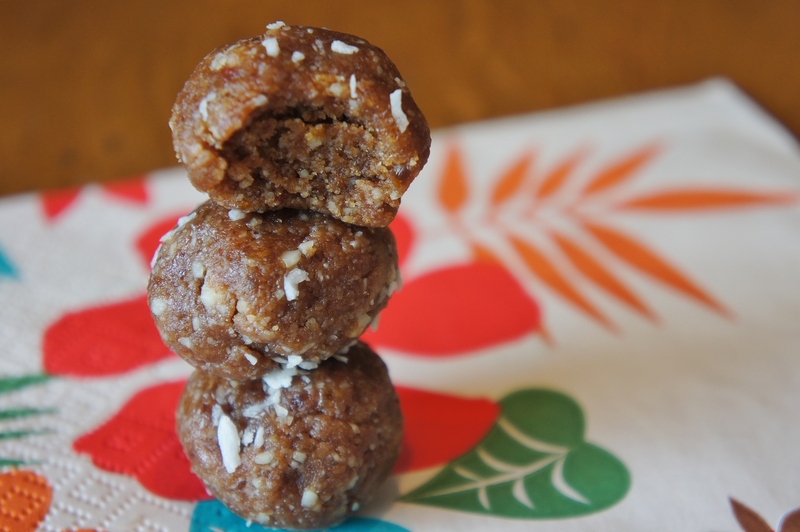 A five minute no bake recipe that will give you 12 delicious bites that are packed with natural sugars, protein, fiber & all good fats. At just 67 calories each, these babies will rid you of any hunger pain or sugar craving whilst giving you a burst of energy. Soak dates in water for a few minutes. Put the almonds in a blender and blend until ground. Add the cocoa powder and blend until combined. Add in the dates & peanut butter and blend until it all comes together and forms a dough (you may need to stop the blender and scrape down the sides a few times). Take a tsp of the dough and roll into a bite-size ball. Repeat until you have 12 equal sized energy bites. Finally, sprinkle with coconut. Store in the fridge for up to 1 week.